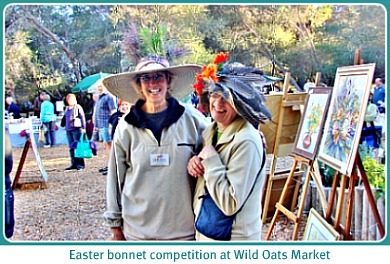 It was not long after Sheila Cooper-Collins had returned from swimming around the Croatian Islands with her friend, Judy Dixon that I sat down with this fun-loving adventuresome lady to talk about her art and what brought her to Sedgefield. Querying her somewhat unusual choice of vacation, she laughingly admitted that the holiday was the way Judy had wished to celebrate her 70th birthday. Sheila was more than willing to go along with the idea as she delights in the sensation of moving through water and swimming is one of her great loves. 11 people in all, joined this activity trip organised by Swimtrek, a UK based company. 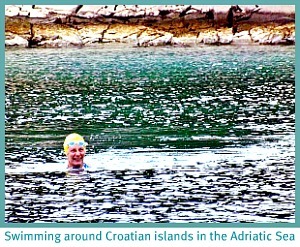 She recounts that it was a wonderful 5 day experience swimming +/- 5kms every day, sometimes along the coast and other times between islands - they touched on 20 different islands in total. Two inflatable boats and a launch that supplied the lunch and loos followed the swimmers each day. Back home, living close to the lagoon edge it is easy for Sheila to go swimming whenever she chooses and she recently has been trying out water aerobic classes. 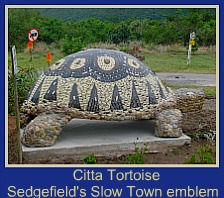 It was in 1992 that a friend of Sheila’s offered her a house to rent in Sedgefield on the Garden Route, when she decided she had had enough of the freezing cold winters of Mooiriver in Natal. When the friend decided to return to the UK and to sell his house in Sedgefield, Sheila jumped at the opportunity to buy it. 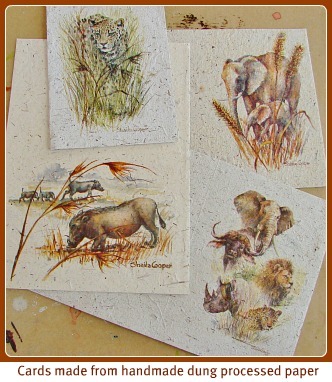 In 1985 in Mooiriver Sheila Cooper-Collins had begun making her own paper using pampas grass. One day whilst visiting Umfolozi Game Reserve she noticed a rhino midden and a thought came into her mind that digested grass in rhino dung could be an easier option. 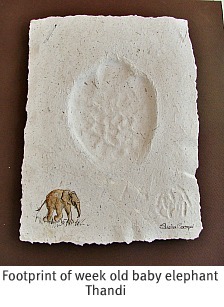 A friend helpfully returned from the game reserve with a large packet wrapped in ribbon full of white rhino dung! 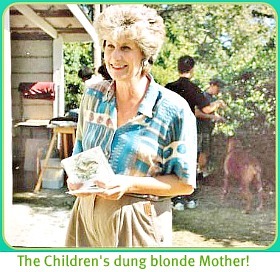 Word got round that Sheila Cooper-Collins was attempting to make paper from rhino dung! This attracted a good a bit of publicity although in a few instances it seemed that she was considered a bit of a nutcase. Undeterred she went on to repeat the process with black rhino and elephant dung. 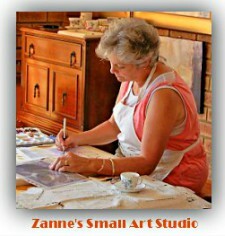 In Sedgefield, Sheila Cooper-Collins continued to experiment and refine her paper making process. It took much trial and error whilst Mark and John trawled around for information and sought help from many sources including chemists at Sappi to produce a workable product. 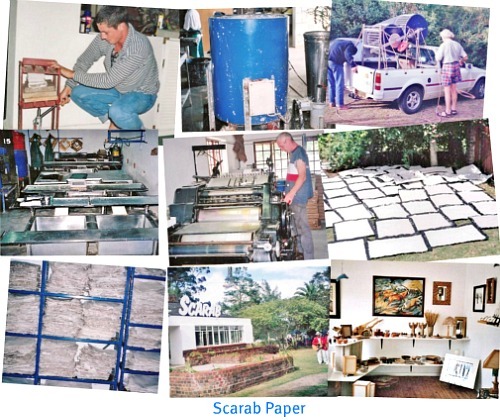 Always innovative she even utilised raw materials such as sea-grass and algae from the Swartvlei Lagoon for her handmade paper! 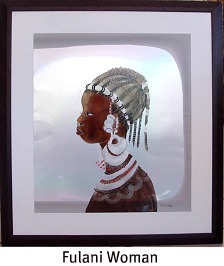 At the time-consuming labour intensive process did not bring buyers rushing to the door however, and one day her son, Mark said to her that to make money with the dung paper Sheila needed to print some of her paintings on it. So Sheila Cooper-Collins began making cards. One day in an airport she saw a display roundabout outside C.N.A. filled with cards and she visualised it being filled with HER cards. In time to come that is just what would happen, 54 of her designs would fill a display roundabout in her own shop. In 1998 at a committee meeting of the WildLife Society, it was decided that R40,000 was needed to print more books of Margo Mackay’s “The Knysa Elephants and their Forest Home". 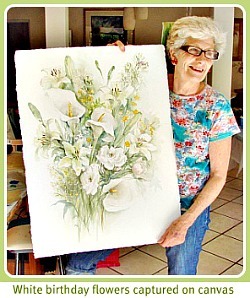 Sheila, a friend of Margo’s had initially painted a picture of the Matriarch (supposedly the last Knysna elephant) in the forest for the front cover of the book. 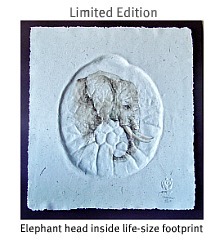 Being a nature lover and taking a keen interest in conservation, Sheila almost recklessly offered to help by creating a limited edition of the Matriarch painting on elephant dung paper. Many people cooperated in the fund raising effort including the foresters who collected dung in the forest for the making of 1000 sheets of paper! 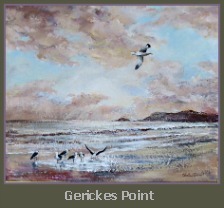 When Sheila finished the painting it had to be taken to Cape Town to be printed onto the dung paper. 50/50 filmed the staff making the elephant dung paper and Sheila painting the original picture in the forest and aired it on their show. On the day that the prints were made available to the public the operators worked non-stop taking phone – calls from interested buyers. 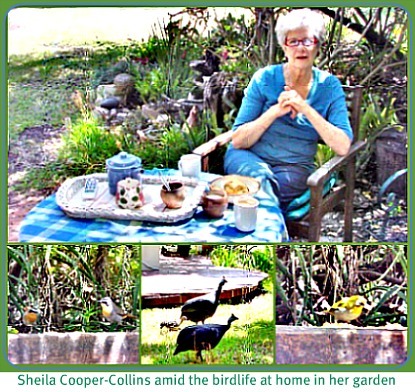 Back in Sedgefield, Sheila Cooper-Collins waited anxiously but heard nothing and thought the venture had flopped. A day later she found out, that everyone had been too busy fielding calls to let her know how successful the fundraiser had been! 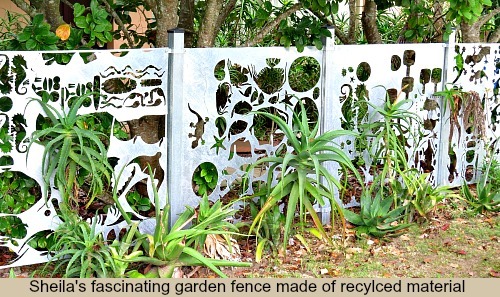 The prints raised far more than required to pay for the books to be printed and so most of the R350,000 was designated by The Wild Life Society to be spent on environmental education programmes. 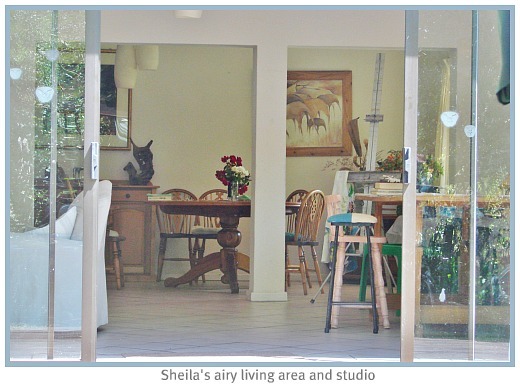 Sheila’s business in Sedgefield had begun in her double garage on the Island – the one garage was her workshop and then the second garage became her shop window. With the help of her sons Mark and John, innovative thinking produced equipment for each stage of the paper making process - the pulping drum, the pulping basins, a simple make-shift press made from a car–jack. In time that gave way to their 4 ton paper press and the purchase of their ultimate sophisticated marvel, the Heidelberg Printing Press that could handle everything they asked of it. Even with this wonder, it still took 18 months to get to litho-print full multi-colour handmade paper. The paper had to go through the rollers several times before each colour was printed on it separately. The next colour had to be precisely on the top of the first and over the next, etc. to get a quality finished product. By Oct 2001 the business had outgrown the garages and was moved to the house that formed the basis of what was to become, the Scarab Market. Earlier in the year, Sheila Cooper-Collins had been asked by the Post office if she would design a set of stamps to commemorate National Marine Day. 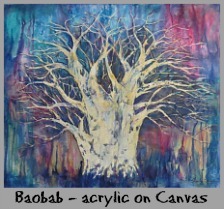 She decided to use silk dyes and liquid water colours to portray the vibrant colours of the sea-life she painted. 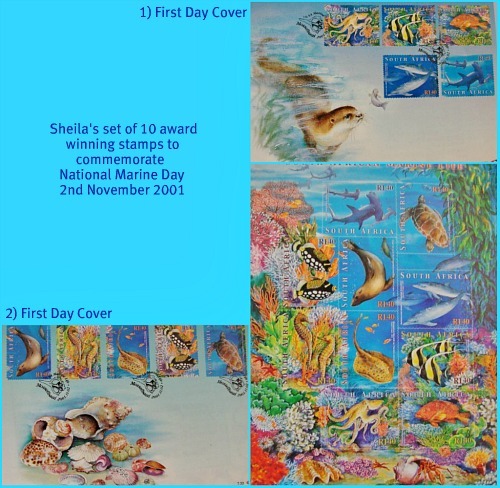 The result was an award winning set of 10 stamps commemorated on two different first day covers that were launched on 2 November 2001. It was a busy year! 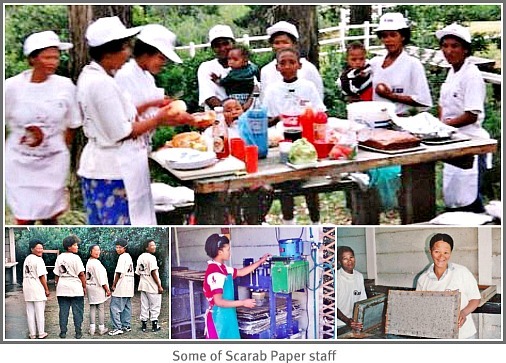 Scarab Paper grew to employ 17 single mothers from Smutsville many of whom became like family and were treated like family too. The annual staff Christmas party included all the family members and was thoroughly enjoyed by one and all. 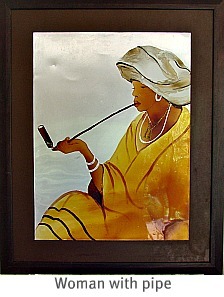 Most of the girls were uneducated but as time went by they learned many skills besides paper-making. Their confidence grew to the point where they could act as tour guides showing visitors around the factory explaining in English or Afrikaans, how the whole dung paper process worked. 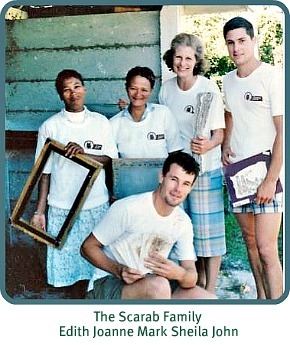 Scarab Paper was in fact 4 businesses in one. There was the factory, the wholesale side, retail side and printing business. In 2002 Sheila’s two boys Mark and John who were outdoor fitness fanatics decided it was time to leave the business, now well established, and go their own way. They had represented South Africa in the Camel Trophy in 1998 coming first in the International Selections and 2nd in the Finals. They were both into adventure races wherever they took place around the world. Mark was to meet his wife to be (Belin from Spain) in Chile where they were both participating in sports adventure events. John met his German wife to be, Christine, in Tonga, Samoa in the same way. All four had represented their countries in international competitions. 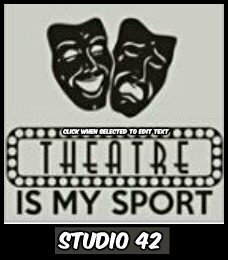 All good friends, this adventure sports focused foursome would go on to establish a premium event production company in Knysna called “Magnetic South”. 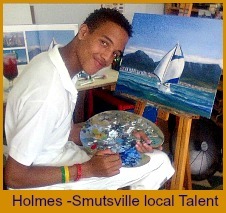 Sheila’s beautiful and talented middle child, a daughter Jean, lives and works in Cape Town. Besides her job as a Marketing Manager for Virgin Health, she cycles and runs and is a professional photographer and proficient artist. 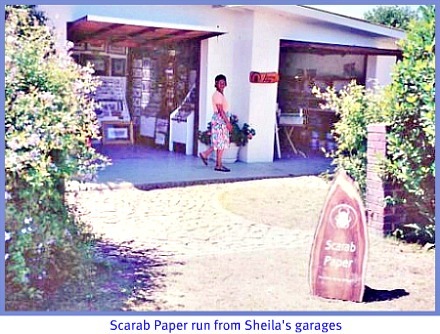 Sheila Cooper-Collins could have taken on the whole business of Scarab Paper by herself but interested buyers, Andre and Rita Knoetse timeously presented themselves and she decided to sell Scarab Paper so that she could concentrate on her real love, painting. 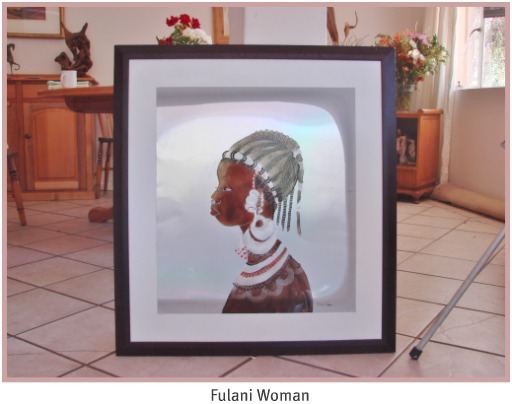 Thanks to her mother, Sheila had studied Fine Art at Wits University – and it’s in appreciation for her mother that she signs her work with her maiden name, Sheila Cooper. Her work with Professor Raymond Dart whilst studying has always stood her in good stead for her paintings of wild life are accurate and show close attention to detail. 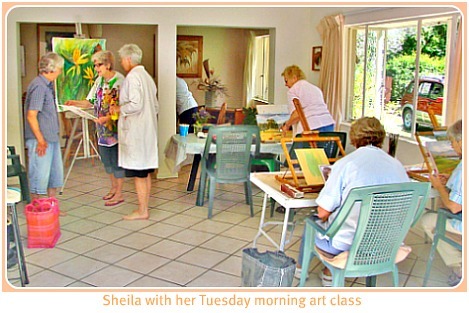 Whilst teaching +/- 21 people in 2 art classes held morning and afternoon, one day a week, Sheila is now free to spend a good part of her time trying out new mediums for expressing her artistic talent. 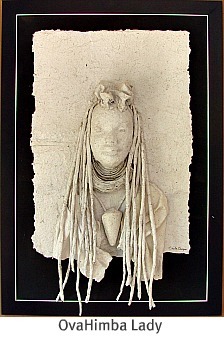 While being confident with water-colours, oils and acrylics she has turned her hands to moulding stunningly graceful three-dimensional busts such as the OvaHimba Lady and Tuareg Lady (see right hand column) from her paper pulp. 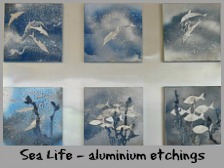 Besides this, she has forayed into aluminium pictures using sheets from one of her old printing presses. It is a tricky procedure as she has no control over how the varnish coats the aluminium and sometimes has had to wipe it off up to 12 times and start again. 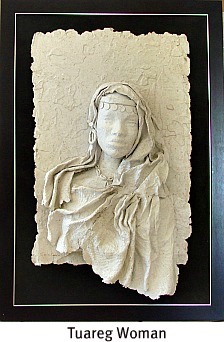 Fascinated by all the different effects she can achieve with these diverse techniques, Sheila Cooper-Collins is unafraid to try anything her mind can imagine. Like a true artist, a new idea just gets her creative juices going and she is consistently able to express her concepts in a tangible way. As I left a couple of hours later, a whirl of images in my head, my impression of Sheila Cooper-Collins is of a free spirit who treads lightly on our world, lives unpretentiously and finds joy in simple pleasures. As a mother she has clearly encouraged her children to follow their dreams and they are accomplished adults in their fields of endeavour. 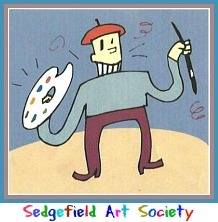 A friendly, generous-hearted woman of light and warmth, this unassuming, widely acclaimed and gifted artist, is truly a Sedgefield icon we can be proud of. Magnetic South is a premium event production company owned and run by Sheila's two dynamic sons and their wives. Their pedigree is in sports, media and the outdoors. They specialise in the innovation, production and management of unique concepts followed through with articulate implementation. 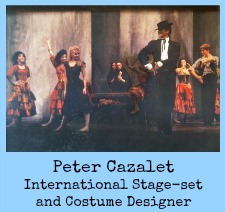 Their productions are gauged on the extent to which they inspire. THESE PICTURES BELOW CAN BE BOUGHT FROM THE ARTIST DIRECTLY. Just complete the form at the bottom of this page and email it to Sheila.